Geotypografika » Blog Archive » Achlan wa sachlan, Mona! Above: Recent VCUQatar graduate Mona’s latest efforts in Cairo, Egypt. new company, they gave her free reign on this small poster project. OK so this is so far one of my favorite things I did at work. 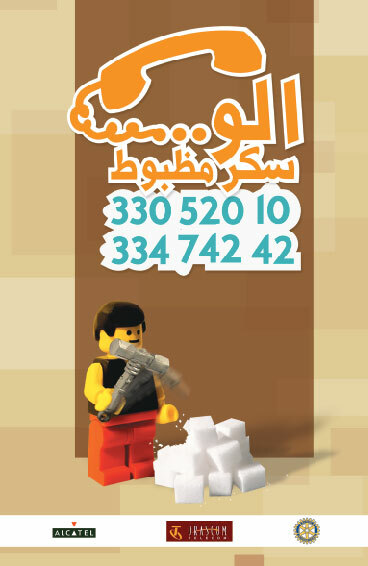 The brief was to make a flyer for a diabetic young people organization to promote their hot line. They just gave me the contacts and the sponsoring logos and the rest was all up to me finally. I wrote down some ideas n talked about it with my creative director then we narrowed it down to the most suitable idea that can be executed and understood easily by young people and adults of course. So I came up with a “fun” kinda concept, which is the Lego man, and believe it or not the Lego man and the hammer were from 2 separate images, n I actually managed to make them look as one, I couldn’t imagine that I can do that, that’s what I get from working in the real world, anyway then I played with the sugar cubes n voila! Oh no wait then came the type I had some difficulties because I wanted to work on the hierarchy and be attractive enough n goes along with the “cartoonish” look. It also says “ALO SUKAR MAZBOT” its usually said when ppl ask for tea or coffee and they go like sukar mazbut which means the right amount of sugar. Now Voila! You are one in a million, Mona. We hope to hear from you often (I’ve asked Mona to send an occasional Geotypografika story from Cairo). Achlan wa sachlan, Mona! Redux? This entry was posted by Erik Brandt on Sunday, January 27th, 2008 at 10:37 AM	and is filed under Aktuell, Education, Geotypografika, Globalization, Graphic Design, International, Internet, Musica Viva, Typografika, Typography.